The Great Plains of North America slope east from the Rocky Mountains, extending south from Canada, through Kansas, and on into Texas. 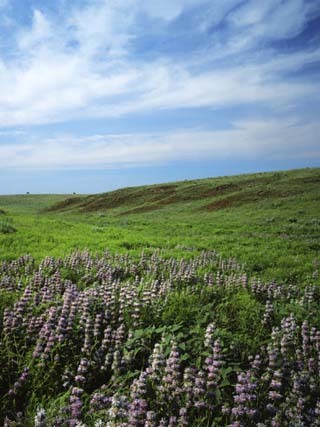 The fertile shortgrass prairies and rolling plains of central and eastern Kansas are hilly in many places, especially directly east of Wichita in the Flint Hills, as well as in the Red Hills and Smoky Hills. The high plains of far western Kansas rise to its border with Colorado, and there, in a series of relatively low mountains, stands the state's highest point, Mt. Sunflower, at 4,039 ft. The state's lowest point is along the banks of the Verdigris River in the southeast. Major rivers of Kansas include the Missouri along its northeastern border with Missouri, and the Arkansas, Kansas, Saline, Smoky Hill and Republican. For a closer look at the overall topography of Kansas, view this topographic map!